Hi Folks, I've drop up in my Bazaar the drop boxes because I thought you might like access to the pyramid ones in particular for your Christmas tables. Cut and use either the ring or ribbon to hold up. The varieties are cubed, triangle, hexagon and pentagon. 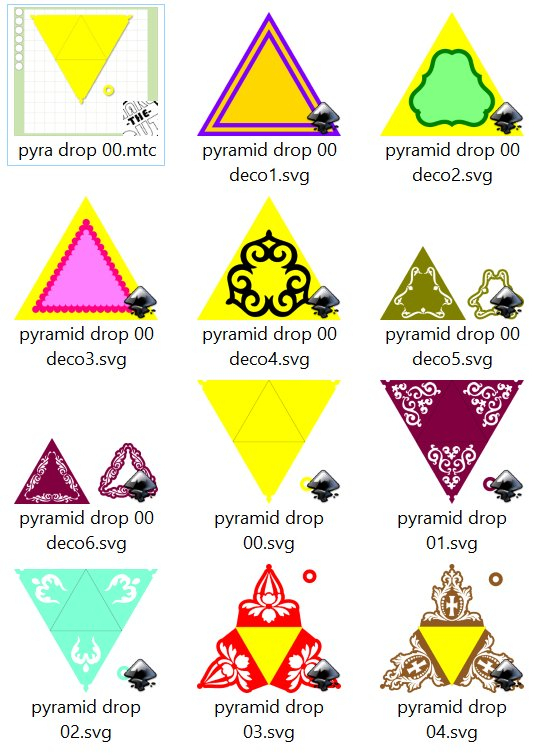 Anyway here are screen shots of the pyramid options but none have been cut so I am chancing my arm on the pentagon ones! You will find them under 'boxes/drop' in their own folders. The link is below in my signature (Archimedes Bazaar). These are attractive designs to cover any kind of event but don't you think that these designs can be drawn easily! By the way, thank you for sharing the designs. Fabiola - Yes these designs are basic - but don't forget not everyone can design or create originals. What I do and put up are for people to use as is or to give them food for thought of how they can do their own designs. Not everything I do is that basic! @FabiolaBettley Having supported cutter owners for the past 13 years, I can assure you that the majority do NOT create the kinds of files that Diana freely shares. In most cases they can't design and in other cases they don't want to take the time. Diana's files are very well-received here and at the Facebook groups where she announces her updates. Diana, your designs are anything but basic or easy! The detail that you put into your files is incredible. Your brain goes places that mine can't even imagine. I would love to spend some time crafting with you! Thank you, I always enjoy seeing what you are doing now. These are great.